The new Komeco Simply Irresistible is ready ! After a lot of work during the last weeks, the new Komeco Simply Irresistible is ready. 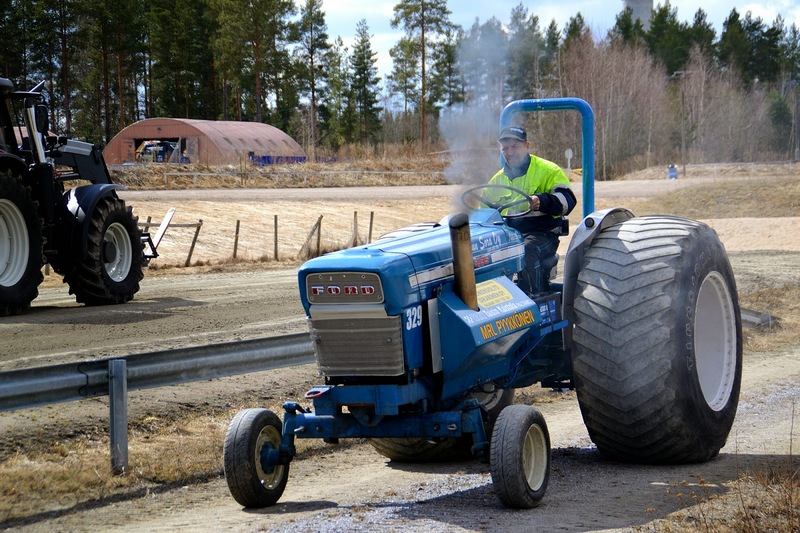 The Modified tractor got a new Domex wedge frame and a set new bigger front tyres. The 4 front New Centurie V8 engines are sitting now a few cm further back on the tractor. The team hopes to get a better balance in the Unlimited / Super Modified class with those changes. 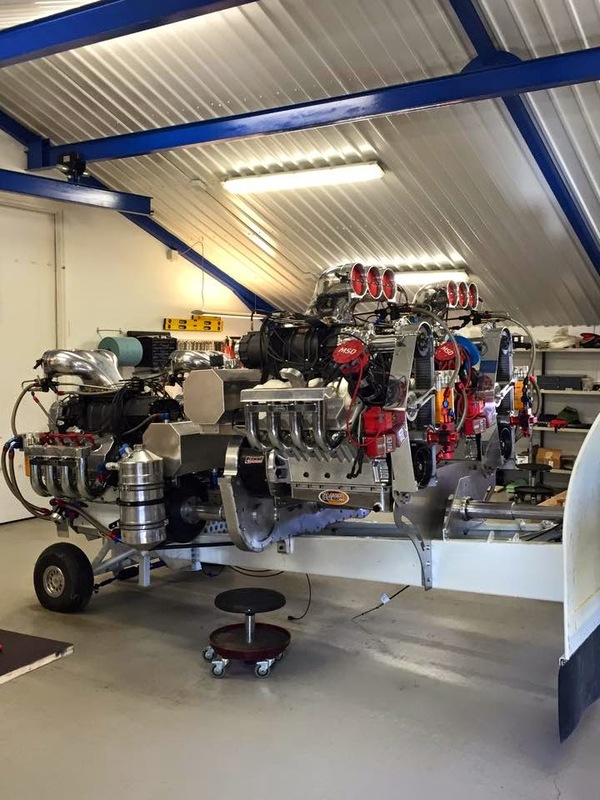 Also, all New Centurie V8 engines were revised during the last winter. The Team will compete in the Dutch Grand National Championship (Unlimited division) this year. After a 1 year absence, the new Hot Head mini rod is ready. The new mini rod is blown by a KB V8 Hemi engine on methanol. 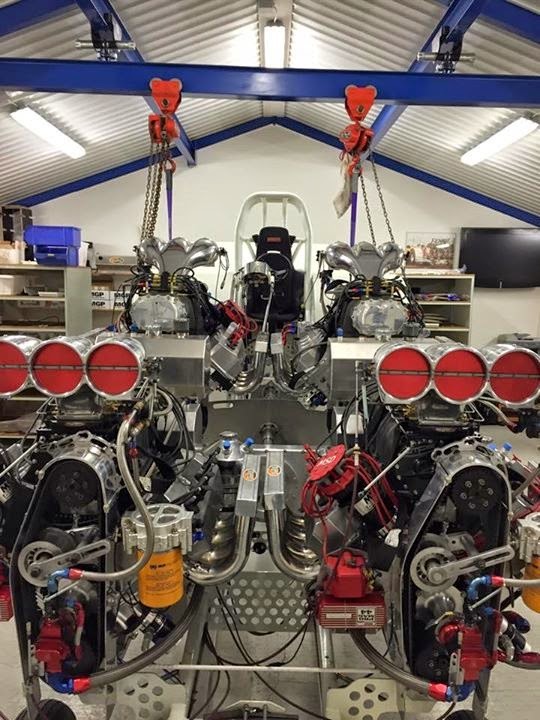 The team bought the engine from Scott Tedder last year. 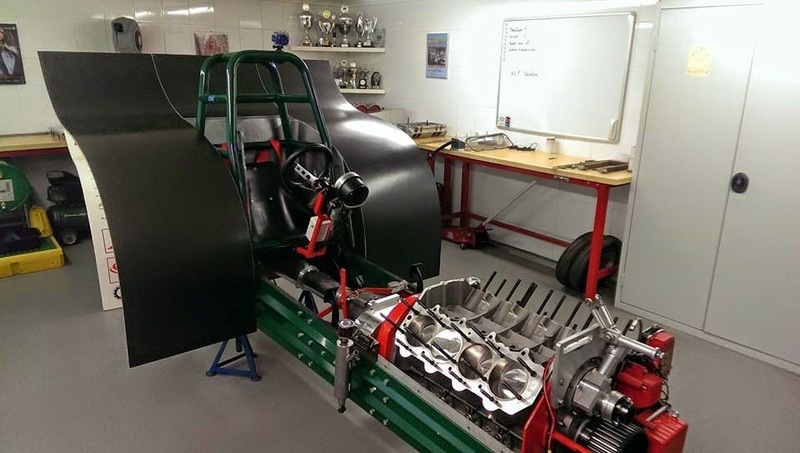 The engine has a 14-71 Littlefield blower with a carbon scoop, a MSD Pro Mag 44 ignition, a data logger, a Veney fuel system and Veney cylinder heads. 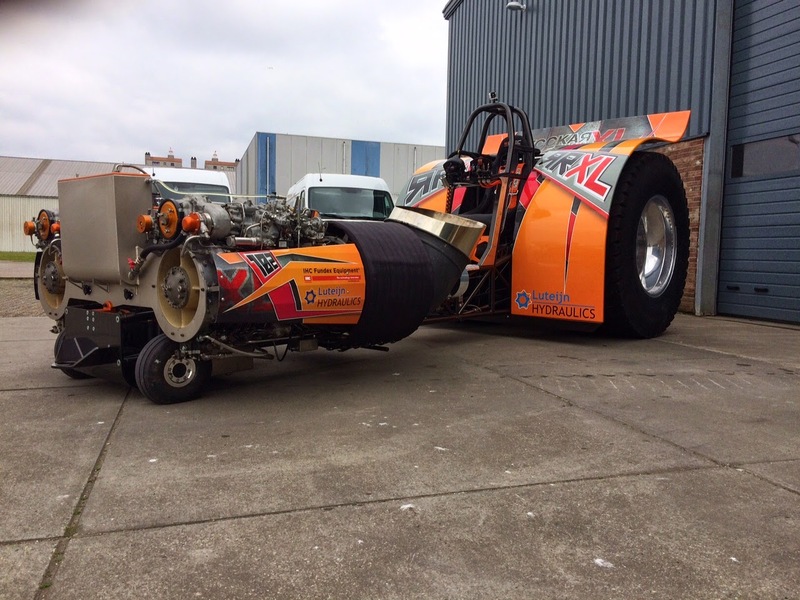 The engine was used before in a Top Fuel Dragster. The tractor got a new 42CrMo4 tube frame with a newly constructed rear axle. The ROP and the driver´s position on the mini rod is more forward and center of gravety is lower. The Team hopes to get a better balance with the Pioneer Puller tyres (new name of the Cepek tyres) with those changes. The new fenders are made from carbon fiber. The gearbox of the mini rod, comes from the Lambada 8. 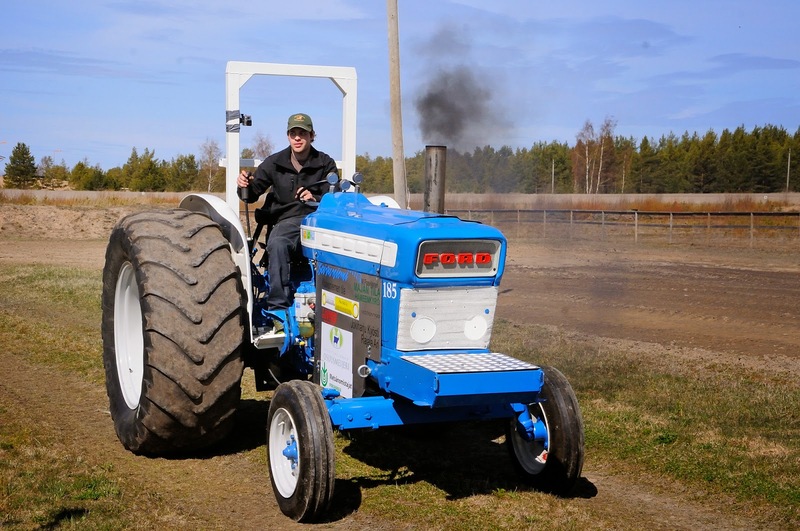 Also, the tractor got a new paint job and the fenders / fuel tank gets a new design (wasn´t ready for Füchtorf). 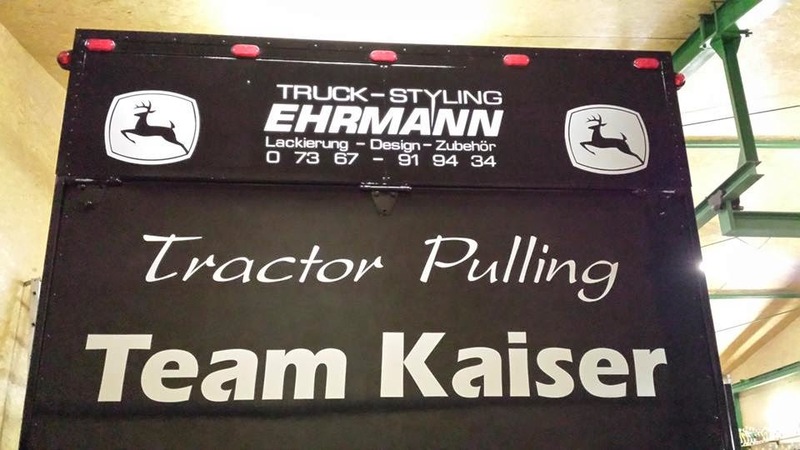 The Hot Head Pulling Team from Ostbevern in Germany, will be compete in the German Championship this year. !Photos from Füchtorf are online! 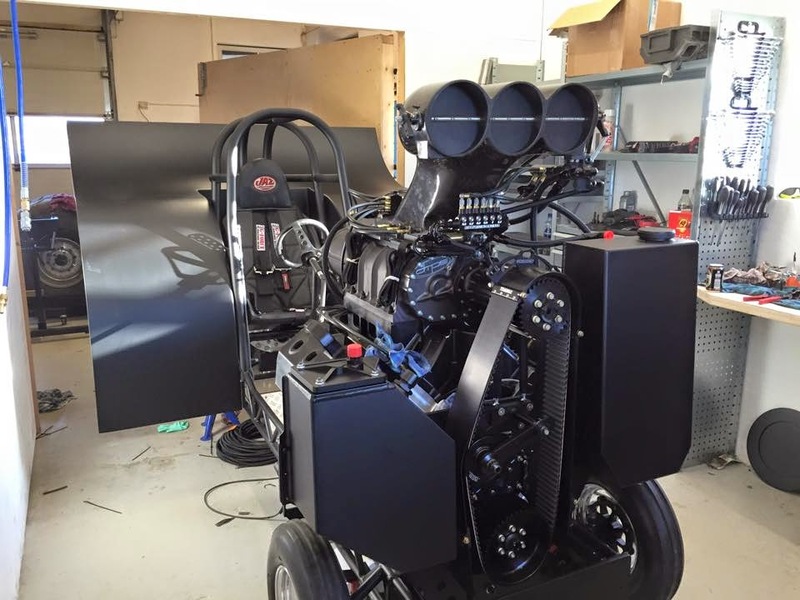 The twin Isotov TV3 powered Light Modified tractor called ,,Russian Roulette XL´´ got some big changes during the last winter. The Team from Breskens, in the Netherlands bought a set of new Firestone Puller 2000 HP tyres with new Northern Sheen rims. Also, the tube frame of the tractor got some changes. The driver´s position moved more forward and the center of gravety is lower. 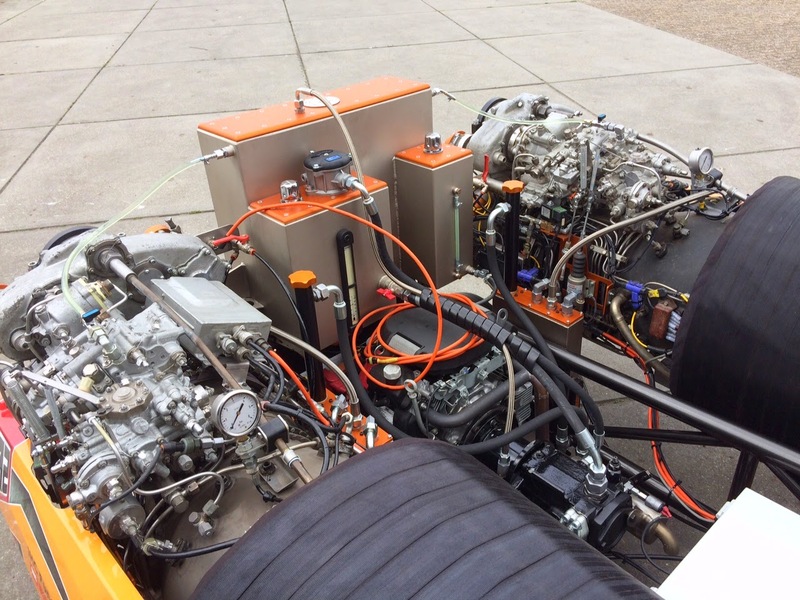 Also, the both Isotov TV 3 helicopter turbines moved a little bit more forward and the Light Mod got a new fuel tank / oil tank combination on the front end of the frame. The Team hopes to get a better balance with those changes. And last but not least, the both turbines get a new air intake funnels. 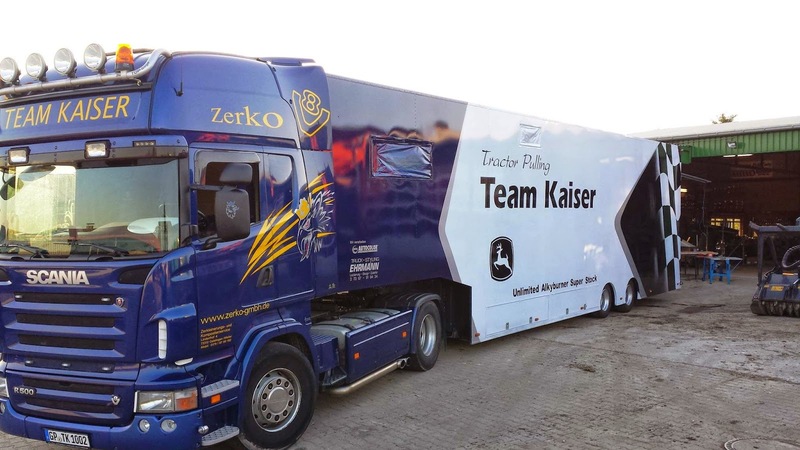 The Team will compete in the Dutch Grand National Championship and in the Euro Cup this year. 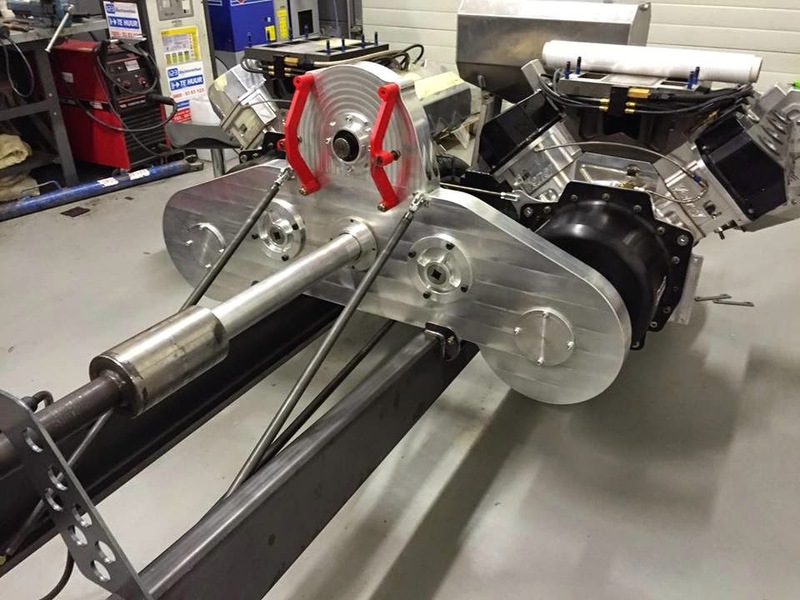 The first test is planned for the 26th of April 2015 at the German Championship round in Füchtorf, Germany. 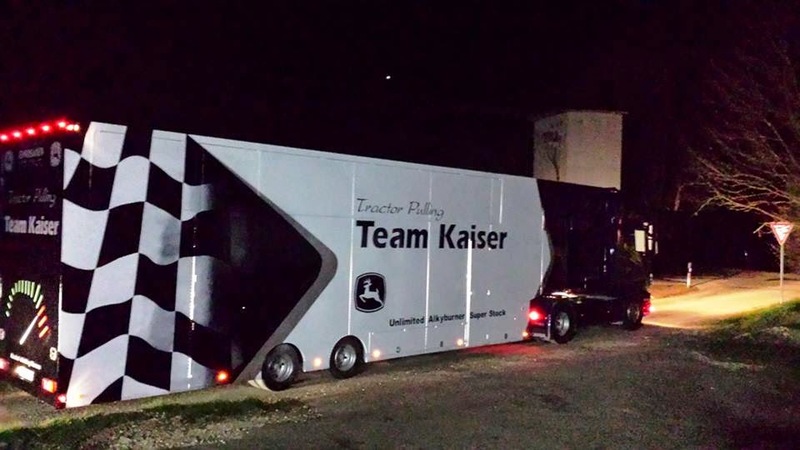 The Kaiser Pulling Team from Gussenstadt, in Germany have built a new truck trailer during the last years. The new trailer has a living room and has enough space for two Pulling Tractors. 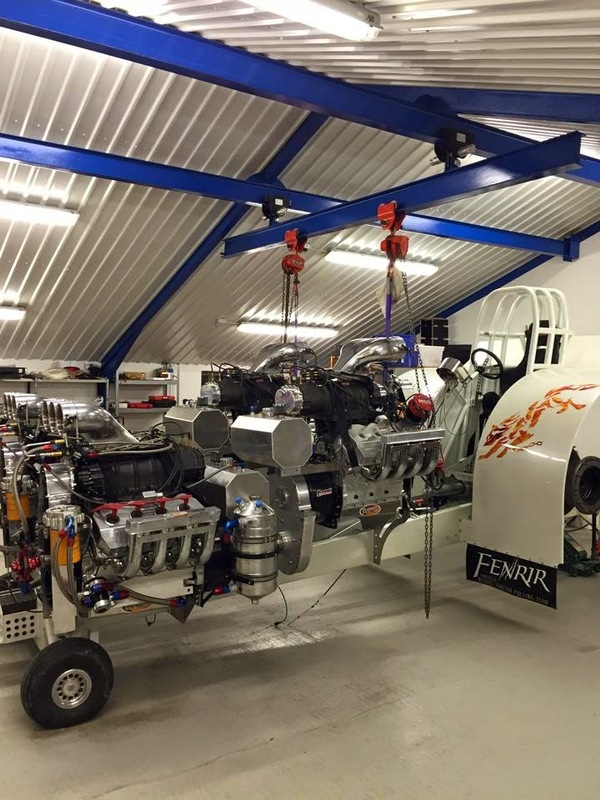 The Nordic Tractor Pulling Team from Skjern, in Denmark makes the step into the Super Modified class with their Modified tractor called ,,Fenrir´´. After a season in the Light Modified class with two Hemi´s, the Team has decided to drive also in the Super Modified class, this year. The tractor got a new SCS Crossbox for 4 engines and a new SCS reverser. Also, the engines got a few changes. All BAE V8 Hemi engines got new Veney cylinder heads and the engines were rebuilt to dry sump lubrication. The Team will compete in the Danish Championship (Light Mod & Super Mod division) and in the Euro Cup (Light Mod & Super Mod division) this year. 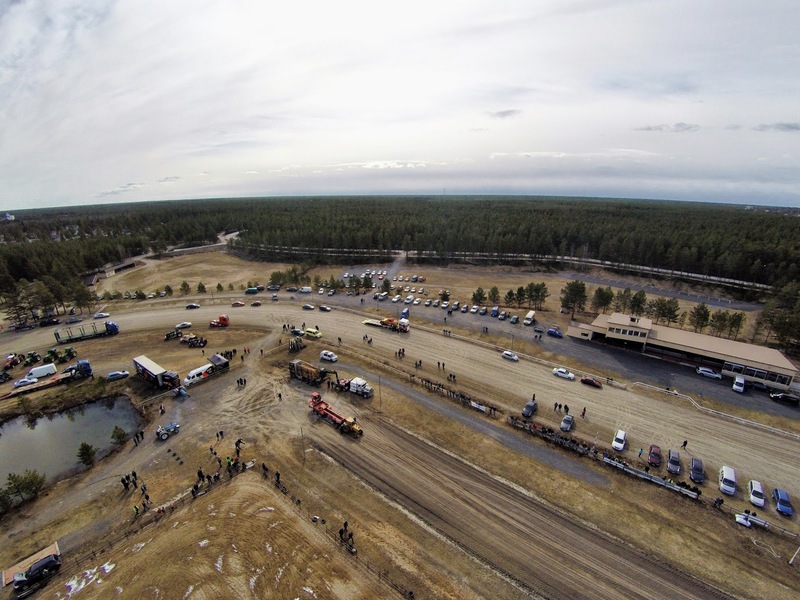 The first start is planned for the 3rd of May 2015 at the Euro Cup opener in Brande, Denmark with those changes. 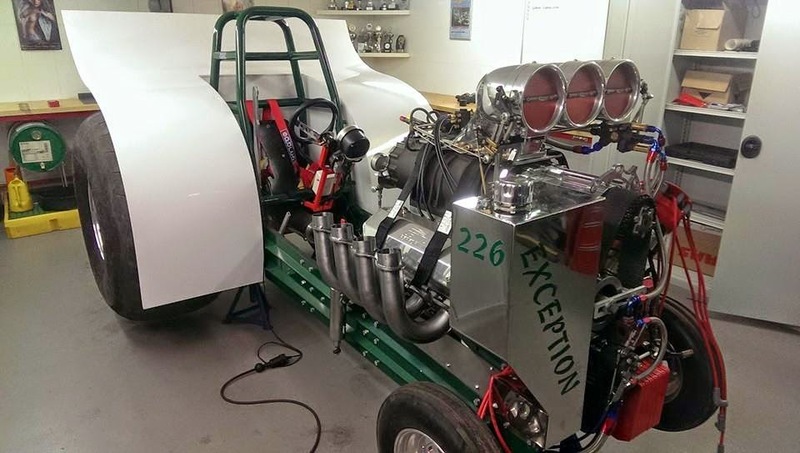 The Dutch Mini Rod called ,,Exception´´ got some changes after the Indoor Pull in Zwolle, the Netherlands. 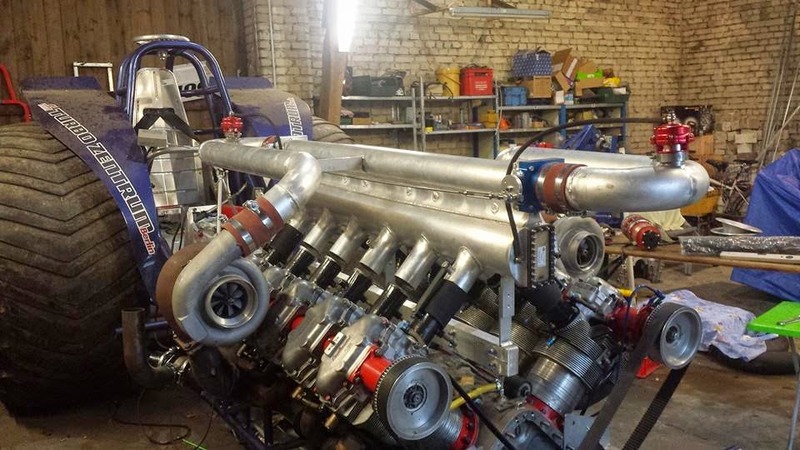 The SSI 14-71 blower of the New Centurie V8 engine got some new seals, new homemade exhaust pipes and the damaged cylinder heads were repaired at Post & Dros in Dronten (NL). The tractor got some new lighter Carbon Fiber fenders. 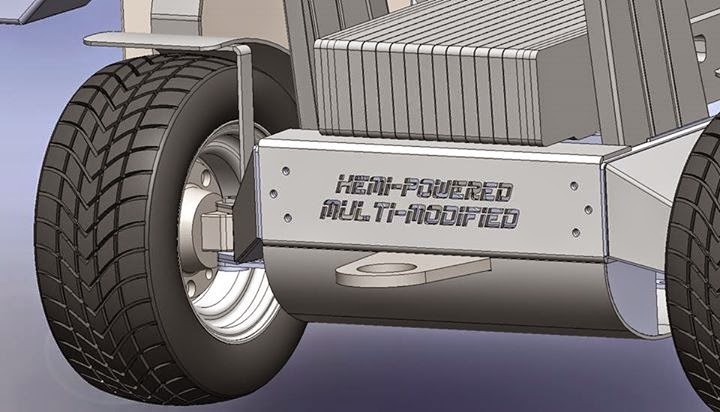 Also, the fenders gets a new design. 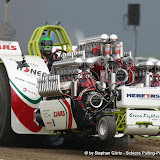 The Team from Exloërveen , in the Netherlands will compete in the Dutch Grand National Championship, this year. 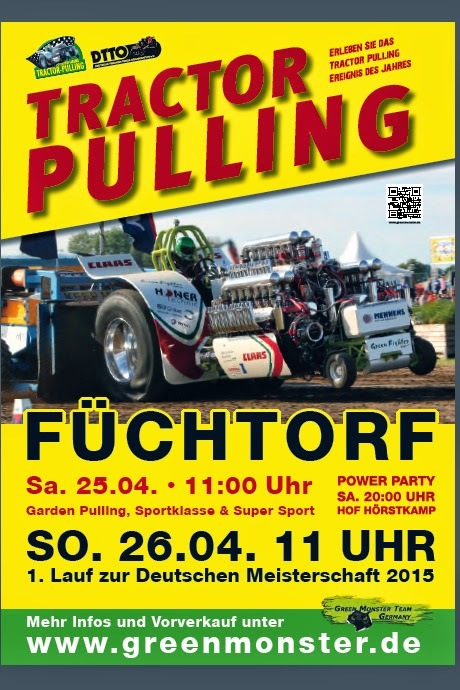 The first start is planned for the 26th of April 2015 in Füchtorf, Germany. 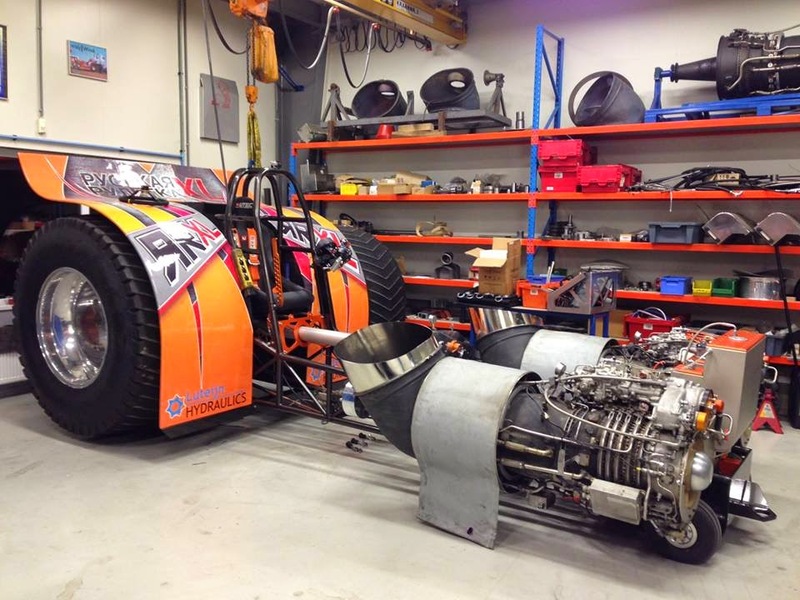 The Norwegian Mini Rod Pulling Team called ,,Blower Power´´ has now their own facebook site. 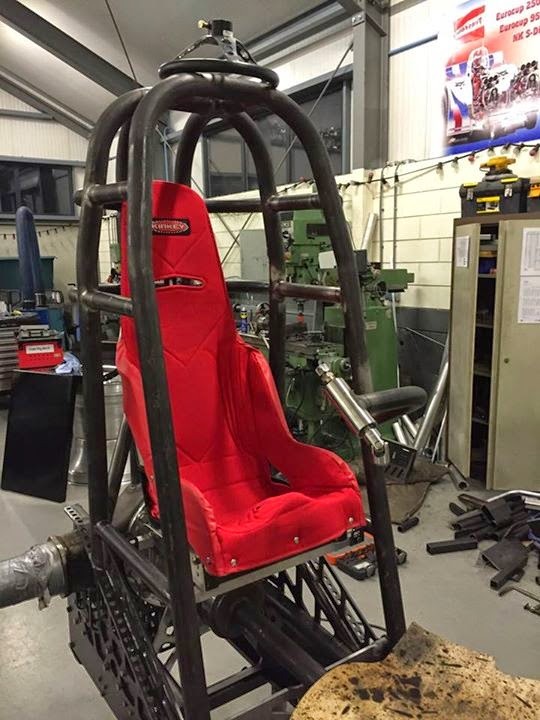 Motorsport Madness ahead for the north west! I am really looking forward to the upcoming days! This weekend the European Outdoor Season really kicks off with the 30th anniversary event in Füchtorf (near Osnabrück). The Saturday (25th of April) will have all day action from 11 am to 8 pm with a huge field of Garden Pullers, Sport and Super Sport classes. 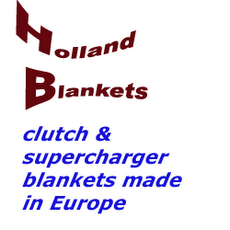 The 3.6t Super Sport class should offer thrilling competition with several dutch machines joining the German competitors. Who keeps the HX80 spinning and how well do the Puller 2000s do against the Michelin and Kleber tyres on the Füchtorf track? 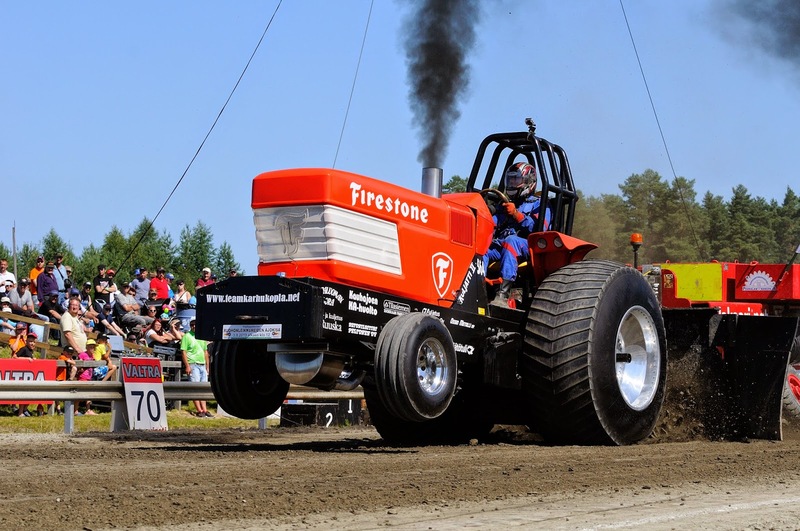 Sunday is also jam packed with top level competition with tractors from all over Europe. On the first of May, the German Speedway league kicks off at Brokstedt, a little north of Hamburg, right east of the A7 with Norden Sharks (Friesland) vs. Brokstedt Vikings. Match start there is 14:00h and they should be done by 16:30h. From there it's another 3h drive to Brande, so you could arrive at the camping at Brande just in time for BBQ. 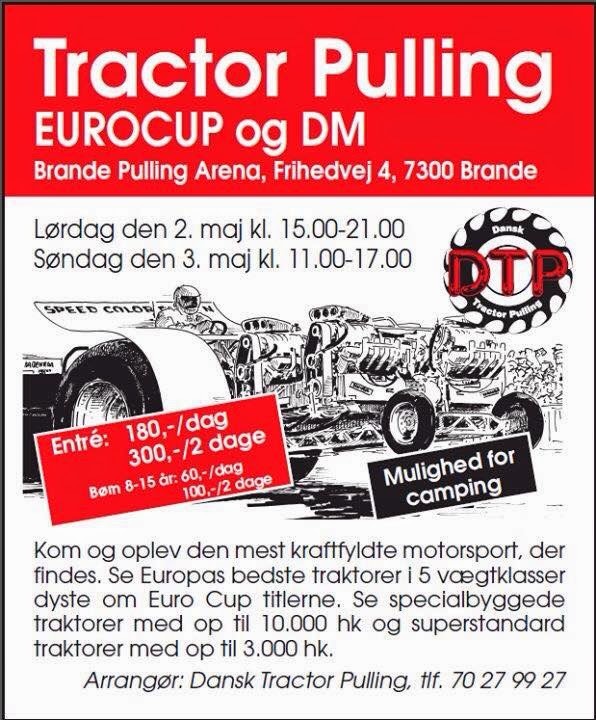 On the second and third of May it's of course Euro Cup time at the new Pulling Arena in Brande (DK). Super nice, spacious facility, good tracks and the best of the best. What else could you ask for? In my case, a little more time off work. 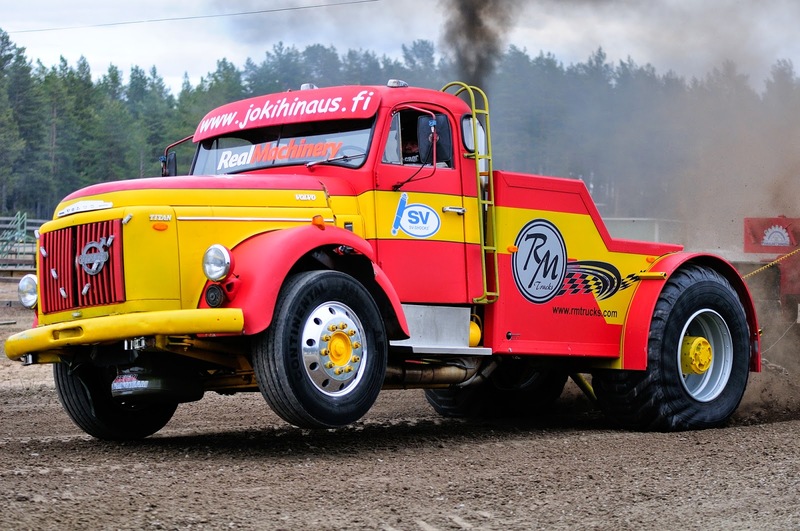 I have to stay close to home and will spend that weekend helping at the local Master of Speedway at Moorwinkelsdamm. 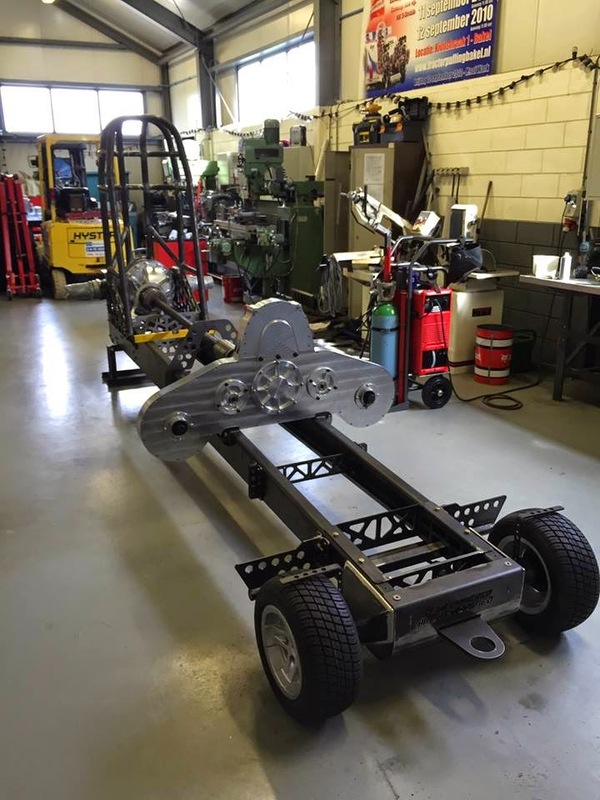 The Screamin´ Bobcat Team from Ijsselmuiden, in the Netherlands are building a new tractor for the Light Modified class at the moment. The new Wicked Screamer gets a new Domex wedge frame and a new constructed ROP. The parts for the Domex wedge frame were laser cut and bent by Tosec in Zwolle, the Netherlands. The drivers position is more forward and the center of gravety is lower, than on his big brother called ,,Double Screamin´´. Also, the new front tyres are a little bit bigger. The Team hopes to get a better balance on the new Light Mod with those changes. 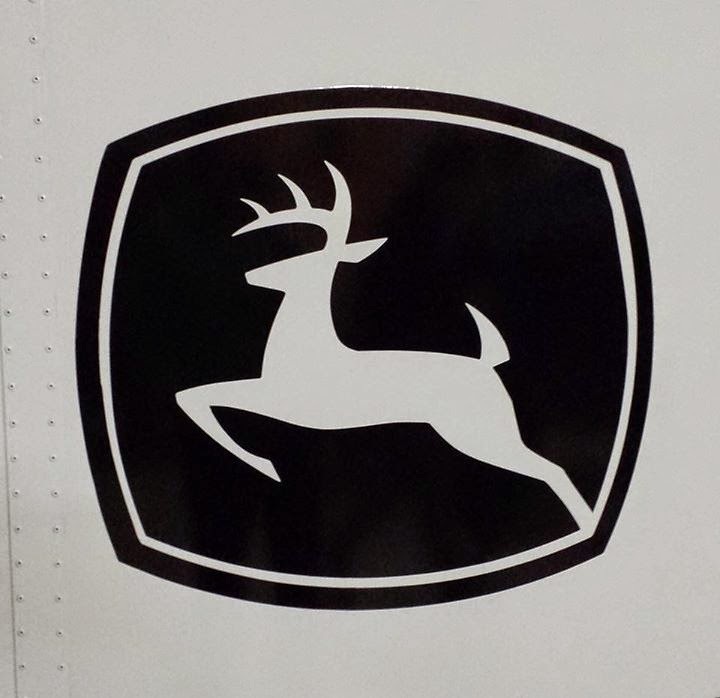 The tractor will have 2 BAE V8 Hemi engines with SSI 14-71 blower, Veney cylinder heads, MSD 44 Pro Mag ignitions, Enderle scoops and a Sassy fuel system on both engines. 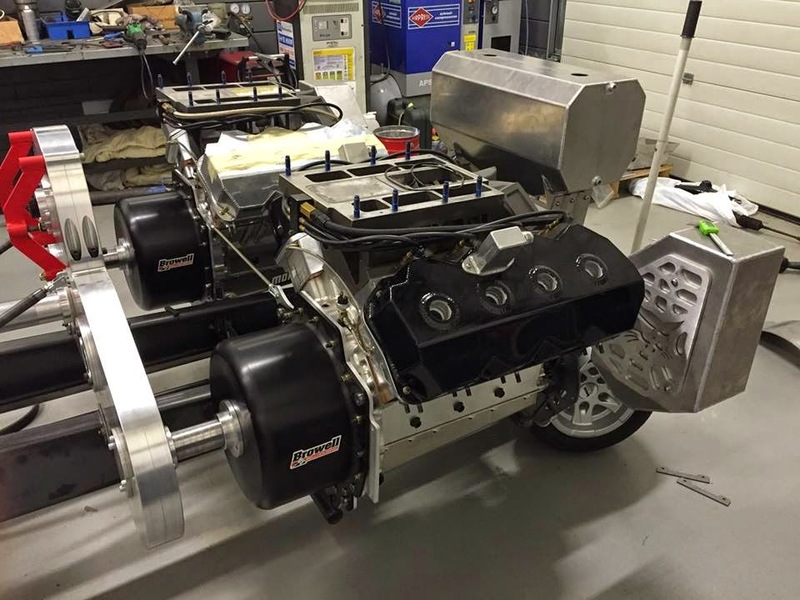 The both tanks on the Hemi engines are for the dry sump lubrication. 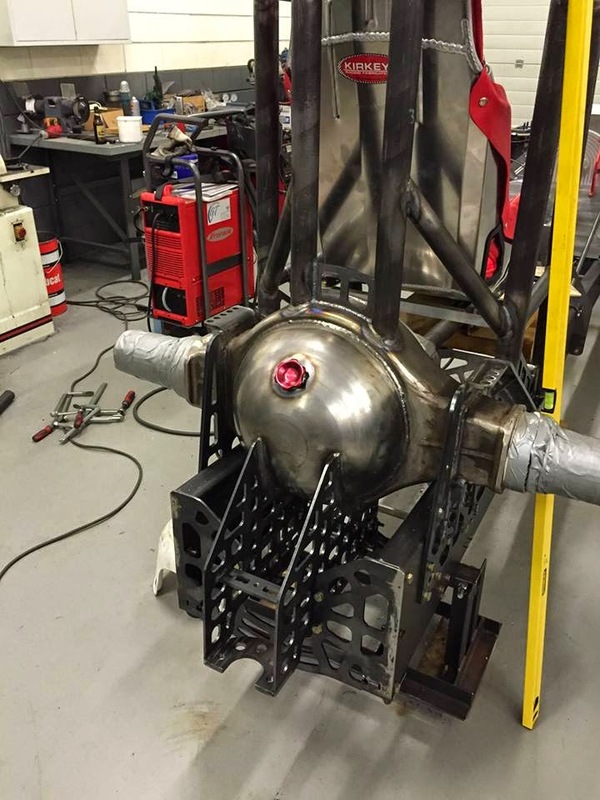 The new methanol fuel tank sits on the front end of the frame. The new rear axle is homemade with Humpco parts and the new crossbox was constructed/designed by Bennie Vreemann (Vreemann Special Parts). 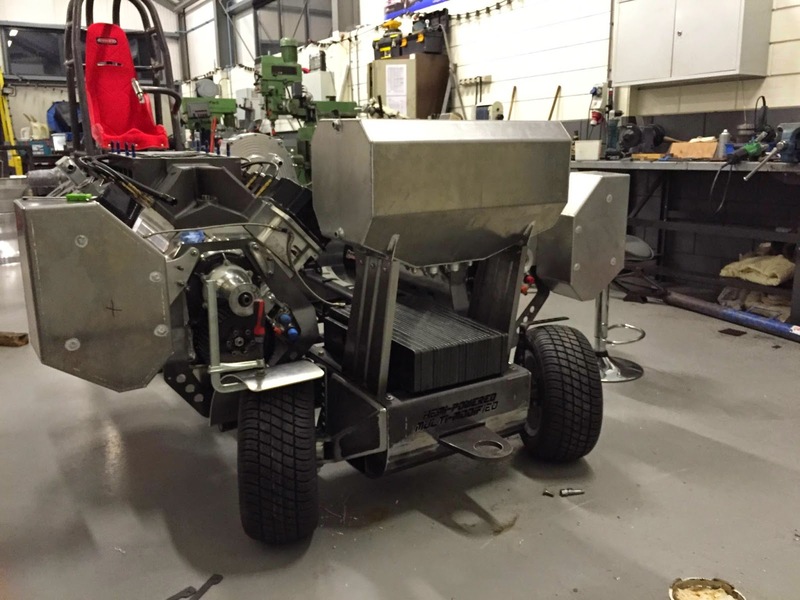 The new crossbox was milled by Breman Machinery in the Netherlands. The new Carbon Fiber fenders of the tractor will made by the Rocket Science Pulling Team . The new Light Mod gets a set of new Northern Sheen rims with Firestone Puller 2000 HP tyres. 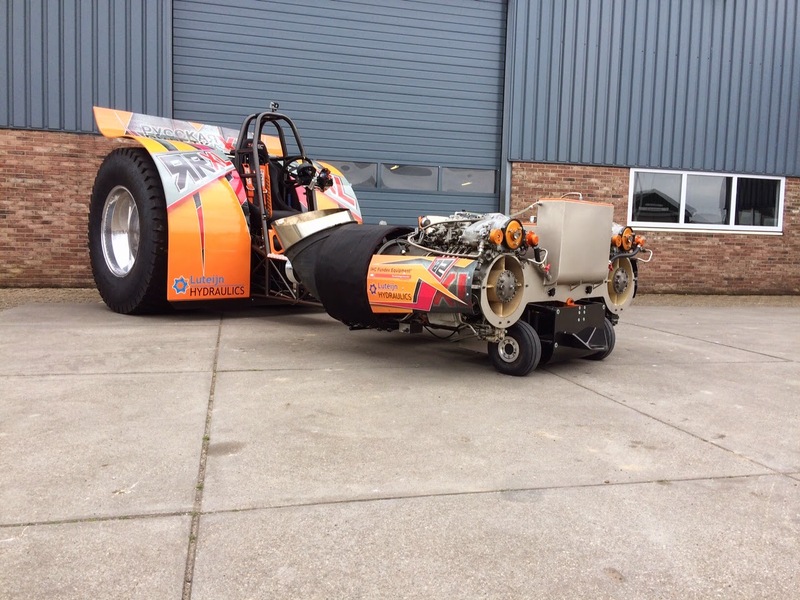 The Screamin Bobcat Team will compete with their new Wicked Screamer in the Dutch Grand National Championship and in the Euro Cup this year. 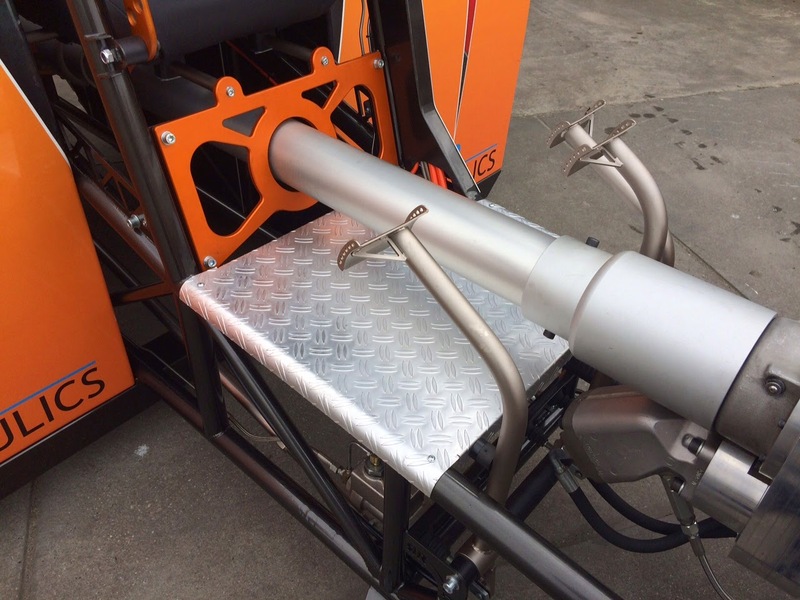 The first start of the the new Light Mod is planned for the 23rd of May 2015 at the Dutch Grand National Championship opener in Stroe, the Netherlands. 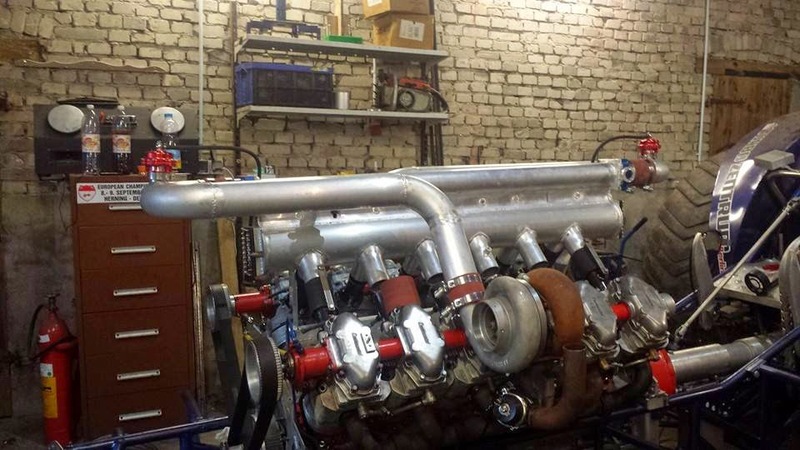 The Continental V12 powered Light Modified from Füchtorf in Germany got some changes during the last winter. 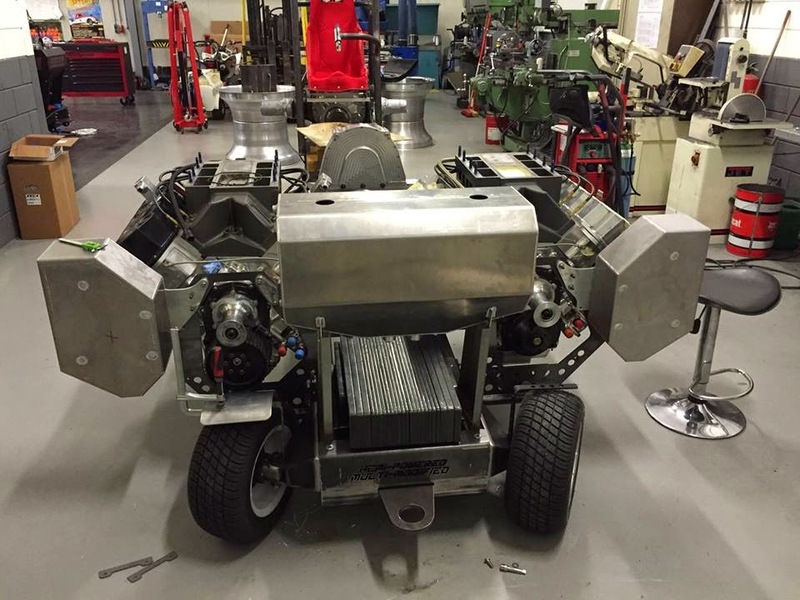 The chassis got a new front end and a set smaller new tires with aluminum rims. The chassis is now a bit lower on the front end with those changes. The engine was taken apart to every single part in the last months. Some rods, pistons, wrist pins and other parts were replaced by new or used ones in good condition. The complete oil system was modified and rebuilt, including a new pump. Also, the injection system gets some changes and new possibilities to make a good setup. Also, the ignition timing will be changed a bit. 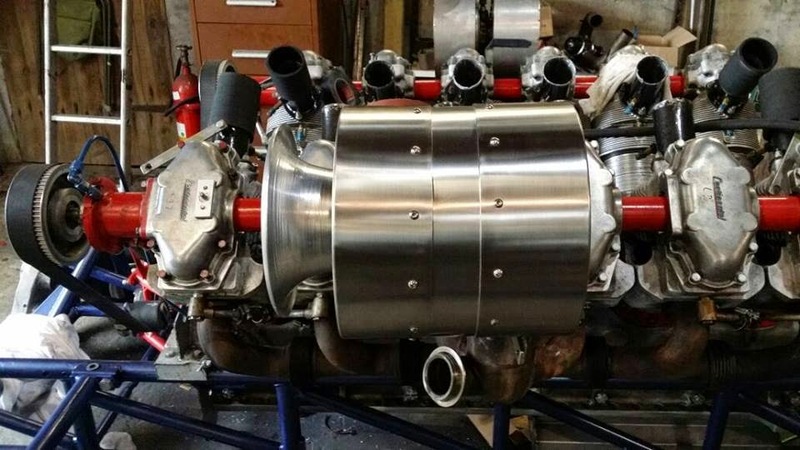 The twin turbo engine got a complete new intake manifold with new throttle bodies in a different constellation than before. 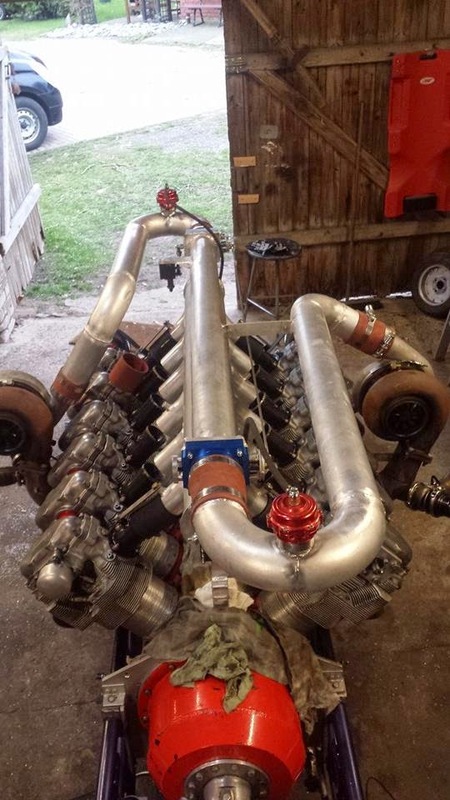 The Team hopes to get a better air flow in the new intake manifold with those changes. 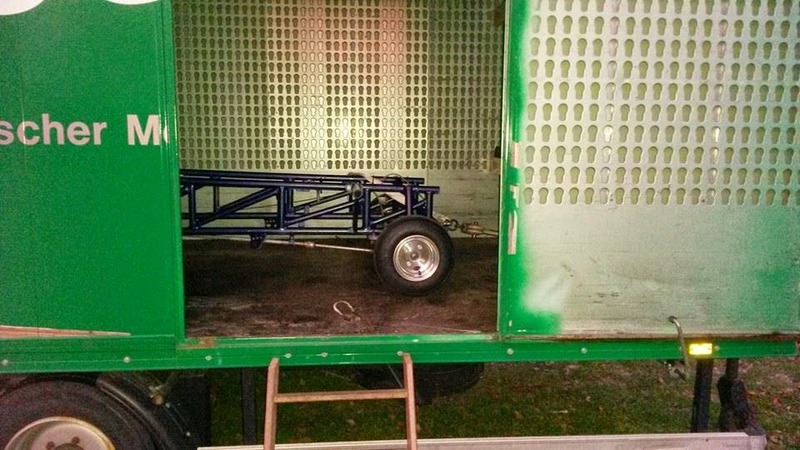 Not all work is done by now, but they work hard to get it on track soon with their new trailer. It's planned to compete in the German Championship in the Light Modified and Modified class this year. 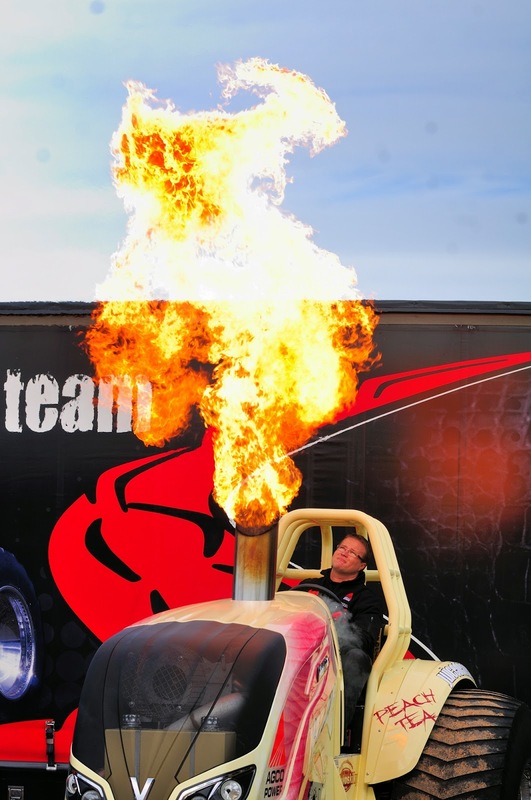 Backdraft is ready for the season !